Back in 2005, Vanessa came up with the idea to create a show that would combine her love of cooking and her flair for entertaining. Her reputation for hosting well-catered events at her home was already well known, for Vanessa is no novice in the kitchen. She got together some of her celebrity friends for dinner and taped a pilot for the show called In The Company of Friends. With guests like Bernie Mac, Sinbad, Lela Rochon, Kenny Lattimore, and Chanté Moore, TV One’s interest was keen. The network aired the show as a special in 2007. Although TV One decided not to order additional episodes, Vanessa did not give up her dream. She felt in her soul the show would work. Four years later in 2011, Vanessa decided to reboot the show on her own in one last attempt to bring her dream to life. 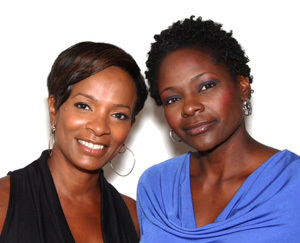 She connected with producer Camille Irons Coakley of the Black Women’s Entertainment Network, who loved the idea and immediately jumped on board. After a year of trying to raise sponsorship to produce the show, Vanessa decided to take the money she earned on Shameless and shoot the show herself. She called up some of her close friends and invited them to the special event. Camille wrangled up the film crew. Two weeks later, the cameras were rolling. The show was filmed in one day – the tea party was shot in the afternoon and the dinner party was shot later that night. The cast and crew pulled double duty, but they got the job done. Vanessa and Camille both believe no one should ever give up her dream. They also understand hard work really does pay off. They hope you enjoy the production—the result of Vanessa’s dream and the pair’s labor of love – In The Company Of Friends.